Firstly add the CMyTabCtrl.cpp and CMyTabCtrl.h to your project. Using Visual Studio add a CTabCtrl control to your dialog. Add a member variable for this control as a CMyTabCtrl type not a simple CTabCtrl. CMyTabCtrl is derived from CTabCtrl. 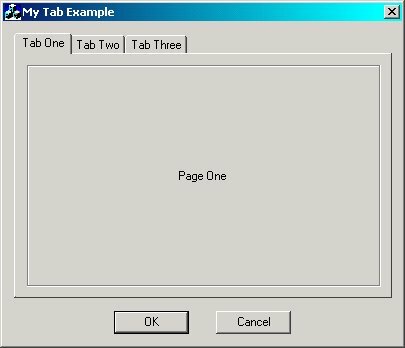 Now create dialogs for every page you require. These must be child dialogs with no border. Any controls here in these dialogs are handled by their own class. Create a Class for each dialog. In the example these are CTabOne, CTabTwo and CTabThree. In this example the OnLButtonDown message handler is used to show and hide the various dialogs. The page is managed with a variable m_tabCurrent which holds the value of selected pages. In the main app dialogs OnInitDialog message handler add the tabs you require for your dialog. In this example these are Tab One, Tab Two and Tab Three. Functionality for the left and right cursor keys to select the tabs can be added in the CMyTabCtrl class. The Dialog Showing, Hiding and Drawing code is from the C++ Forum On this site. It was posted by someone whom I don't have name for. I hope this code is of some use. It has helped me to develop much more complex dialogs.